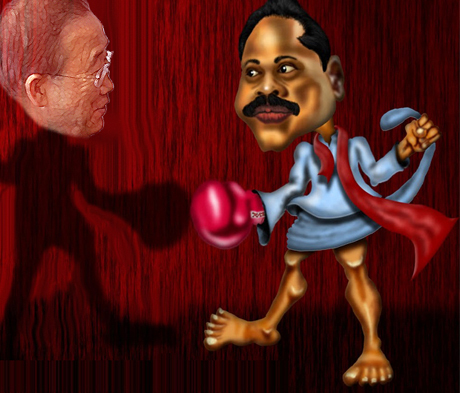 UN Secretary General Ban Ki Moon also is fast being seen as a victim by some and a weakling by others – so much so that his photograph alone is enough for the Rajapakse supporters to emotionally excite blind followers, against the United Nations. This drama is expected to be staged on the streets of Colombo, on May 1. (April 30, New Delhi, Sri Lanka Guardian) There is much talk about Accountability these days – at UN level. Where was this Accountability problem when more than 60,000 Sinhalese youth disappeared and killed by the Sinhalese leadership just three decades ago? So now the United Nations came up with the report which is called “Darusman Report”, with lots of errors and is asking for credible investigation on Sri Lanka. Many of us find this amusing and we see someone laughing. Who? – None other than the person who has hoarded more political power than most politicians of our current times - “His Excellency President Mahinda Rajapakse”. War crimes as directly observed by Sri Lankans happened in large scale through Sinhalese Youth Uprising against the Regime. That is the parallel of the Libyan uprising that we observe today. No UN, NATO or Allied forces came to our aid back then. There was no call for war crime inquiry. We managed ourselves. We reconstructed ourselves and we are continuing to fight for self governance at all levels of society. It was far more difficult for Sinhalese to see their own forces killing them. This seriously damages our self confidence as a community which is the foundation on which we elect National Government. Yet there was no one from the so called Global Governance to take care of us after that war. Did anyone influence or urge or demand accountability for those massacres? Why not? Is that because of Sinhalese youth eliminated by the Sinhalese leadership are considered less valuable than Tamil civilians? When reading the reports by M.C.M. Iqbal who was secretary to two of Sri Lanka’s Truth Commissions, in regard to over 30,000 disappearances and/or deaths – I felt that those war heroes were the forgotten orphans. That they were dead and buried and their fight for freedom and self governance has also been buried with them. This is the kind of leadership we have. Now the so called international community is urging “accountability with credible International norms and standard.” The fact that there has been no mention of those war crimes in the UN Report and any UN inquiry is an insult to every Sri Lankan who has genuinely invested in self governance. The fact that the Political Leadership in Colombo is taking advantage of the report makes a mockery of our investments in democracy. It is also suicidal for the democratic forces within the political leadership. Yes, all democratic forces in that leadership are committing suicide. There is a Sinhalese saying that, Beeri Alinta Weena Gayana Karanawa wage, (Looks like playing a fiddle to a deaf elephant). The official report of the United Nations which has asked for credible investigations into War Crimes which might have happened in Sri Lanka during the final stages of the ethnic War, also gives one the impression that the United Nations Secretary General is playing his fiddle to a deaf Elephant. As Mr. Basil Fernando of the Asian Human Rights Commission based in Hong Kong has pointed out in his recent article “law without rule of law” published by the Sri Lanka Guardian, this current UN demand for accountability is like an audit report of Accounts without a Book-keeping system. Mr. Basil Fernando highlights the serious problems due to huge gap between reality and theory through which reports are structured. We, Sri Lanka have enough laws on paper but problem is that majority do not even have knowledge of it, leave alone reconciling it to our cultural norms or reconciling the actual outcomes to the outcomes that the laws would have produced. In other words, one who does not have a Plan or a Budget has to live with the reality of the actual. To even make any sense of the UN’s expectations of Accountability, majority Sri Lankans, including victims of the recent war, need ground level education in global responsibilities. Until this is done, these reports would be twisted and abused by the Rajapakse clan to make a mockery not only of the UN system but also our own reality, from which they have alienated themselves. The United Nations SG’s panel has totally ignored how this government kidnapped and held in the prison its former Army Commander who led the War against the Tamil Tigers Rebels, the four star General Sarath Fonseka. To majority Democratic Sri Lankans, this was an attempt by the Political leadership to claim ‘sole credit’ for the military victory, rather than share it on merit basis with the military leadership. When the real leadership is denied its earned credit, the morale of followers goes down and they are then easily manipulated by politicians and other custodians of power. UN has failed to address this issue in the report. General Fonseka is also a war victim and when he was imprisoned so were all those who fought on the basis of their faith in his position as a military leader. Yet, the UN inquiry failed to include this in its mandate. Is it because there aren’t enough Sri Lankan expatriates with political influence over western governments? The UN report has used some facts without inner knowledge of our Nation, as if we are second class. We need someone who is a part of us, a Global body that treats us at Equal level to the richer members of the UN - to help us see ourselves – especially that part of us that influences us to kill our own for immediate political benefits.